Mercedes Benz used mechanical fuel injection systems during World War II but first used an electronic fuel injection known as D-Jetronic designed and licensed by Bosch in 1967. Volkwagen followed suit the next year in 1968 by using Air Flow Controlled Electronic Fuel Injection units, (AFC) which were also D-jetronic systems in the type 3 series and Volkswagen installed the first on board diagnotic system the same year. All of the early fuel injection systems used all white wiring systems to prevent customers from attempting to work on the fuel injection themselves. It worked really well. Most customers and independent auto repair shops replaced the fuel injection systems with carburetor kits as soon as the fuel injection malfunctioned. Good technicians could repair the fuel injection units without scan tools, trouble codes, check engine lights, or the Internet to help them. Repairing these systems made us better technicians. GM started installing Assembly Line Data Connectors, (ALDL) in 1980. We learned to repair just what the problem was and we didn’t have to rip the system out and put carburetors in because we couldn't figure out the systems. The California Air Resources Board required all vehicles that were sold in the State of California had to have an on board dignostic system in 1991. Every car manufacturer installed a connector but every system was different and most small shops could not afford all of the assorted connectors for all of the cars. In 1996 the regulations were changed and all cars were required to use a standardized plug for all cars to make it cheaper for independent auto repair shops to afford tools to read the systems. The new standard was called OBD2. Part of this system was that a “Check Engine” light be present in all cars sold in the united States to let clients and state testing facilities know when the computer recognized a fault which could cause the vehicle to malfunction. Some of the technicians Hendersonville Muffler Company in Hendersonville, Tennessee have been repairing on board computer systems since their inception. We have always had the scanners , adapters and software to repair the original ALDL systems and when the OBD2 system was introduced we instantly purchased the necessary equipment for this new system. We have undergone a tremendous amount of training to “turn off” our customer’s check engine lights and keep them off. We are not interested in just turning the light off we are interested in fixing the check engine problems so that the car and trucks will perform as they are intended. We can repair check engine light problems because we have the tools and more importantly the knowledge and experience to go with the tools. If you just go to the auto parts store, read the codes and buy parts you will usually see that little light come right back. 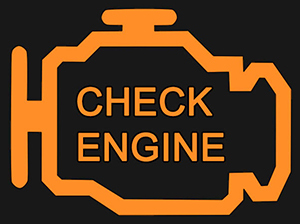 Contrary to popular belief the scan tool does not repair the check engine light. Qualified technicians perform check engine light repairs that PROPERLY repair the OBD2 systems found in today’s cars and trucks. Don’t have the guys at the parts store sell you unnecessary parts at your expense. Get it done correctly. Have your check engine light repaired at Hendersonville Muffler Company. Hendersonville Muffler Company has one of the largest diagnostic collections anywhere in Middle Tennessee to diagnose and repair electronic engine controls and perform check engine light repairs. We have the training and experience to diagnose your check engine repairs and only replace what our clients really need instead of guessing and selling you half of the fuel injection system to repair a small problem. We are familiar with computer performance modifications and modifying modern PCM and ECM controlled cars and trucks and we have the latest test equipment and the experienced technicians to repair automotive computer systems. Hendersonville Muffler Company can handle your check engine light problems and get your car running normally again.